(Natural News) With each passing day, the official story of the Parkland, Florida high school shooting continues to unravel. In its place is emerging an increasingly horrifying conspiracy involving Broward County Sheriff Scott Israel, whose four deputies appear to have been ordered to stand down and allow the shooting to unfold in order to achieve a higher body count (for political gain). When Coral Springs police officers arrived at Marjory Stoneman Douglas High School in Parkland, Florida, on February 14 in the midst of the school shooting crisis, many officers were surprised to find not only that Broward County Sheriff’s Deputy Scot Peterson, the armed school resource officer, had not entered the building, but that three other Broward County Sheriff’s deputies were also outside the school and had not entered, Coral Springs sources tell CNN. The deputies had their pistols drawn and were behind their vehicles, the sources said, and not one of them had gone into the school. …Some Coral Springs police were stunned and upset that the four original Broward County Sheriff’s deputies who were first on the scene did not appear to join them as they entered the school, Coral Springs sources tell CNN. Until this report, we were all aware that one deputy stood by and did nothing while the shooting took place, but this report from CNN raises that number to four, pointing to the likelihood that this was a coordinated stand down order. Imran Awan, his wife, his two brothers Abid and Jamal, and a friend all worked as IT aides for dozens of Democratic members of Congress. Shortly after WikiLeaks published the Democratic National Committee’s emails and during the lead up to the 2016 election, investigators discovered indications that they were using a server “for nefarious purposes” and “could be reading and/or removing information,” according to a briefing. They were banned from the House network in February 2017, but Wasserman Schultz, a Democrat from Florida, refused to fire Awan. I graduated from Stoneman-Douglas in 2004, … the sheriff of my county down here Scott Israel is a politician. He’s a Leftist. He is best friends with Debbie Wasserman Schultz and Ted Deutch. He’s not a sheriff. So when people look at our community now because it’s been thrust into the spotlight and they talk about the sheriff’s department, let’s just be real clear… he is not a sheriff, he’s a politician who masquerades behind a badge. The first thing out of his mouth last week… was gun control. (Unintelligible)… Didn’t say hi to our governor at the press conference, and talked about defeating people who take money from the NRA. Since winning one of the most powerful elected posts in Broward, Sheriff Scott Israel has hired from the ranks of his political supporters, building a community outreach wing his critics say doubles as a re-election team… A log of employees hired by the sheriff shows 10 workers were hired since 2013 into “outreach” roles, their salaries totalling $634,479… Israel’s opponents say he’s built a publicly funded political machine, paying back supporters with jobs and using them to keep him in office. They say the money could be better spent, particularly after the sheriff complained about not having enough funding to secure the county courthouse, where a murder suspect recently escaped. In other words, Sheriff Scott Israel uses taxpayer money to fund his own political re-election “outreach” scheme, shoring up his public image while failing to invest financial resources on stopping murderers. And what better way to steal the limelight for a re-election than to order a “stand down” during a school shooting, then claim to be the savior? “What have I done differently than Don Shula or Abraham Lincoln or Martin Luther King, Ghandi?” Israel asked critics, according to the Sun Sentinel. Adding to the damning evidence against Sheriff Israel, his department had received 20 calls warning about Nikolas Cruz before he carried out the mass shooting. Yet Israel’s office did nothing. Were they ordered to stand down and let the massacre take place, then ordered to allow the shooting to be carried out, without interference? CNN reported that the sheriff’s department had been called to Cruz’s house more than 30 times since 2010. According to one incident report unearthed by the news network, professionals and officers wrote that Cruz suffers from mental illness and had mentioned he was interested in purchasing a gun. …the most serious warning came on November 30, 2017, when a caller located in Massachusetts advised that Cruz was collecting knives and was likely to conduct a school shooting. The caller was concerned Cruz would kill himself and “be a school shooter in the making.” They believed that Cruz’s weapons were kept at a friend’s house. What does this all mean? Increasingly, it looks like the school shooting massacre was allowed to take place by Scott Israel, making sure the disturbed, deranged teen was never arrested or even detained for a mental health evaluation. They knew he would eventually pop off on a deadly rampage, and they did nothing to stop it. Once the shooting began, it’s becoming increasingly obvious that Israel’s deputies were ordered to stand down, making sure the shooter had sufficient time to achieve a high enough body count that would catapult Scott Israel into the national spotlight, gaining him political points while launching a new, nationwide anti-gun initiative that has always been the “end game” goal of Democrat operatives like Obama, Clinton and Schultz. Consider: Who gains from this mass shooting? Who had the motive? Clearly, the Democrats raked in huge gains. Not only did they immediately start fundraising off the tragedy, they are also exploiting the dead and traumatized children as weapons to target their political enemies (conservatives and the NRA). CNN also chalked up huge gains from the event, gaining a huge, nationwide audience for its 100% fake, staged “town hall” circus that looked more like an episode of Jerry Springer than anything resembling a serious news event. Even more importantly, the school shooting shifted the news narrative away from the uncovering of criminal conspiracies involving FBI traitors James Comey, Peter Strzok, Lisa Page and other deep state operatives who are being increasingly outed by congressional investigations. None of this would have been possible of even one of Israel’s deputies had entered the school and engaged Nikolas Cruz with return fire. Such an action — for which these deputies are well trained, by the way — would have immediately halted the casualties and ended the bloodshed. Yet there wasn’t a single Broward County sheriff’s deputy who entered the building during the mass shooting. They literally stood by and did nothing while gunshots rang out and children were slaughtered. The resentment among Coral Springs officials toward Broward County officials about what they perceived to be a dereliction of duty may have reached a boiling point at a vigil the night of February 15, where, in front of dozens of others, Coral Springs City Manager Mike Goodrum confronted Broward County Sheriff Scott Israel. A source familiar with the conversation tells CNN that Goodrum was upset that the Broward deputies had remained outside the school while kids inside could have been bleeding out, among other reasons. In my assessment, none of this was an accident. There are no coincidences in the “no holds barred” bloodsport of politics and gun control. The Left learned very well from Sandy Hook that if enough children are murdered, Democrats can gain tremendous traction on their anti-Second Amendment narrative. Have no doubt that Democrats would easily sacrifice a few dozen children of it means winning the 2018 mid-terms and impeaching President Trump. Over the last two years, Broward County Sheriff Scott Israel became aware of a deranged teen and his threats to carry out mass murder, then realized he could exploit the situation for his own political gain. In order to exploit the situation, when the mass shooting event began, Israel ordered his deputies to stand down, ensuring a large body count. His deputies stood by and intentionally did nothing. The shooting would have been even worse if not for the Coral Springs Police who rushed to the scene, breached the building and halted the violence. His actions also gain major points with his Democrat operative friends like Debbie Wasserman Schultz, who has been at the center of every major political scam and scandal over the last two years, including the DNC’s fraudulent vote rigging against Bernie Sanders. 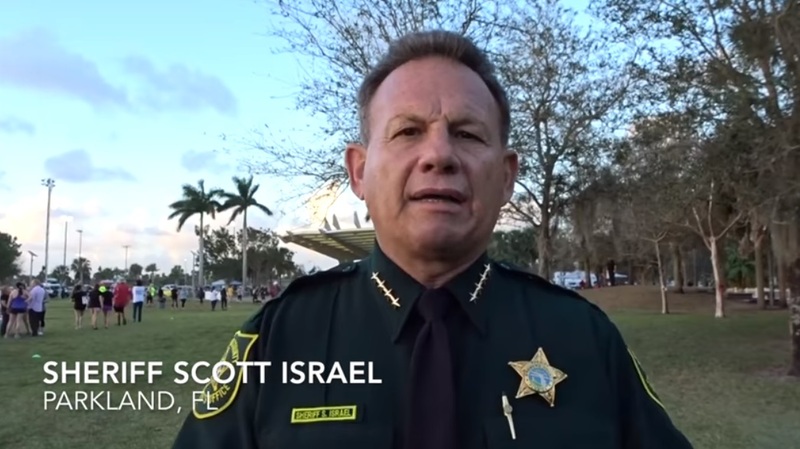 It’s clear to me that Broward County Sheriff Scott Israel is an anti-gun political hack, a Democrat operative, a schemer and a liar. One thing I’ve learned over all the years of working as an award-winning independent journalist and investigator is that Democrats will easily sacrifice children to achieve sufficient political gain. In exactly the same way that Eric Holder and Barack Obama ran Operation Fast & Furious to have Americans murdered in the quest for gun control, it looks like Sheriff Scott Israel oversaw the “allowed mass killing” of schoolchildren in Florida in order to elevate his own fame and fortune while furthering his political party’s gun control agenda, built on the dead bodies of innocent children who didn’t have to die that day… if only just one of Israel’s deputies would have entered the building and engaged the killer. That’s why today, I call on President Trump to initiate a federal investigation into Sheriff Scott Israel’s department to determine why his deputies were ordered to stand down while this shooting was under way. There’s no question in my mind that any sufficiently rigorous investigation will turn up convincing evidence that Sheriff Israel was complicit in the deaths of those high school children and teachers who were killed. Florida Father: CNN Wanted People Who Would "Espouse a Certain Narrative"